This is a cross-post about database diagrams, originally a self-answered question on the new Software Recommendations Stack Exchange site. Up until a few years ago I used Microsoft Visio to reverse engineer an existing database to a diagram. This feature has been deprecated for a while now, and I’m rather stuck in finding an alternative. So, what would be the requirements for an alternative? Most of the requirements below were in Visio, though not all of them. I guess finding one piece of software that has them all is not feasible, but I’d like to get close. Incremental update, e.g. reverse engineer again and have tables added/removed, etc., whilst keeping theme, existing layout, etc. Installer doesn’t secretly install toolbars in my browser or change my home page! Visio 2003 (this is what I used to use). Not free, outdated, but otherwise it fit the bill for most points. Not an option anymore though. Visio 2010 and 2013 (this is what I have currently). Reverse engineering is no longer supported. I’ve considered writing a plugin or using VBA to hack things together though. Not sure how tough that would be. It’s not free (except I guess that I personally have it already), but fits the bill on a lot of other points. Graphviz. Tried this quite some time ago, from what I remember it had a bit steep learning curve and I wasn’t quite able to manually determine final layout. SSMS diagrams. This works for small cases, but can be cumbersome for larger cases. 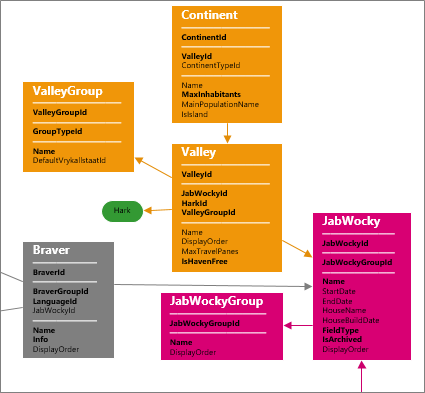 Visual Studio 2012 ADO.NET Entity Data Model. Manual layouting of connectors is limited, theming does not exist at all, it is really meant for a goal other than documentation and it shows (e.g. default you get “Navigation Properties”, etc), and it doesn’t work well for 100+ tables. This may be useful for smaller scenario’s but doesn’t fit the bill for me. And I think I may have tried a few suggestions from the SO threads, though I can’t really remember specifics. So I asked: what would others recommend? Use plain Visio for this. There is no tool that conveniently satisfies all mentioned requirements, not even one that fulfills the main requirements only. Visual Studio 2012 comes close, but lacks theming support and didn’t work very well for a large number of tables. Create a blank Visio Flowchart template. I’ve also tried the UML template and shapes but this has infuriating behavior for connector routing. Not recommended! Choose a design you like. Set the page and print sizes to something you want (I chose landscape A3 format and the “Linear” theme). Open a query in SSMS on the side to get the details you’ll need later: tables, column names, and IS NULL info. Start adding the tables one by one. Choose manually which tables and columns you which to include. Headers are bold and a larger font size. Separators aren’t lines but just a series of bold “—” dashes after eachother. Four “sections”: TableName, Primary Key, Foreign Keys, plain columns. Bold for NOT NULL columns. White for TableName and separators, black for column names. Never allow crossing connectors, and instead creating small “reference” blocks that refer to a table that’s somewhere on the other side of the model. Not include all tables (i.e. there are more foreign keys than connectors). Hopefully the above will be of use to others too. ± This is all possible but not automated. So “more or less”. ✓ Yes, this all works very well with plain Visio. ✓ AFAIK there’s a free Office trial available. I haven’t looked into this though as I have Visio. ✓ Yes, this is available in Visio. It’s a shame I didn’t find any tool that met my requirements. I actually feel like failing in this regard: surely I haven’t looked hard enough? It’s without shame though that I did end up with a rather pretty, useful diagram, with exactly the layout and content I wanted. I guess “Good is the enemy of Perfect” held up here.